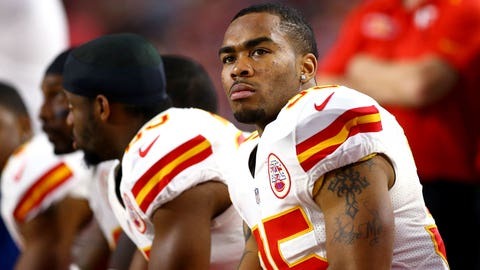 Charcandrick West (35) is hoping to contribute on more than just special teams in his second season. ST. JOSEPH, Mo. — In an otherwise sloppy training camp practice, little-used running back Charcandrick West gave Chiefs coach Andy Reid a moment to smile. The diminutive backup headed out on a passing play, and quarterback Chase Daniel lofted a pass to him. But the throw wobbled off to the right, and West had to reach back with one hand to snare the ball. Then, in one fluid motion, he spun upfield and ran for a touchdown. Not only did Reid smile, the crowd watching let out a collective, "Oh!" "Charcandrick, he can do everything," Reid said. The Chiefs need him to do a little bit of everything, too. The former undrafted free agent out of Abilene Christian fought his way onto the team a year ago and played in six games. But West was merely a special teams player, making more tackles (one) than he had carries, catches or yards from scrimmage. But the Chiefs evidently thought highly enough of West that they were willing to release Cyrus Gray early in training camp, all but giving him the No. 3 running back job. Those carries, catches and yards will still be hard to come by with Jamaal Charles and Knile Davis ahead of him, but like any other player, West is only an injury away from moving up a rung on the ladder. "He’s got great quickness. So that’s a positive from that standpoint. It makes him a little bit different from the other two," Reid said. "He’s a little bit smaller, so it’s a different look than the other two guys in a positive way." West had a chance to showcase that speed in Saturday’s preseason opener in Arizona, when Charles basically got the night off and Davis got banged up. He responded by hauling in a 20-yard catch to help set up a touchdown, and ran six times for 49 yards. His 92 yards from scrimmage were a team high in the 34-19 victory. Lookin’ good! Flip through our photo album of NFL cheerleaders. Perhaps most important, he proved that he isn’t a liability in the passing game. Sure, he has shown that he can catch the ball. But generously listed at 5-foot-10, 205 pounds, West had yet to show the coaching staff he could pick up a blitz. "He’s working hard on the pass protection part of it right now, not as far as knowing who to pick up — he’s a smaller guy, so he’s just working on his fundamentals and his techniques," Reid said. "His pass game, the actual routes, and the run game, he’s doing a phenomenal job." West has even caught the attention of his fellow running backs. "He’s learning the playbook. You can tell it’s slowing down for him," Davis said. "Kind of like myself in my Year Two, he’s more confident with the playbook. He’s playing faster." Speed has never been a question, though. West has always had plenty of it, from his boyhood days on Louisiana schoolyards to his college days in West Texas. It is part of what caught the attention of Chiefs special teams coach Dave Toub, who is often responsible for deciding the last couple of players on the roster. If all else is the same, he will put his vote in for the player — wide receiver, defensive back, running back — who can contribute on special teams, whether it’s the return game or on coverage. It wasn’t only speed that got Toub’s attention, though. "He’s tough — tough as nails," Toub said. "He’ll stick his face in there on any sized guy. He’s an ankle biter and a tackler. He gets in there and is a real good tackler." He’s proving to be a pretty good runner, too. NOTES: LT Eric Fisher’s MRI exam confirmed a left high ankle sprain. "He is literally day to day," Chiefs trainer Rick Burkholder said. … LB Justin March will have surgery Wednesday. He tore his meniscus against the Cardinals. … RT Jeff Allen (knee) was back on the sideline with injured players. He was hurt against Arizona and absent from the field Monday.